Several months after a Kentucky sheriff’s office reached a court settlement with two students with disabilities who had been handcuffed above the elbows at school, the U.S. Department of Education announced on Thursday an initiative to address the “possible inappropriate use” of restraint and seclusion in schools. That initiative will include compliance reviews by the department’s Office for Civil Rights to explore whether district seclusion and restraint practices violate federal law. Those reviews, according to a department media release, will focus on whether the use of seclusion and restraint affects schools’ obligation to provide special-needs students with a “free appropriate public education” as required by the Rehabilitation Act of 1973 and the Individuals with Disabilities Education Act. The Office for Civil Rights will work with districts found to be out of compliance to address the issues, the department said. Seclusion refers to the practice of confining a student alone in a room that he or she is not allowed to leave. 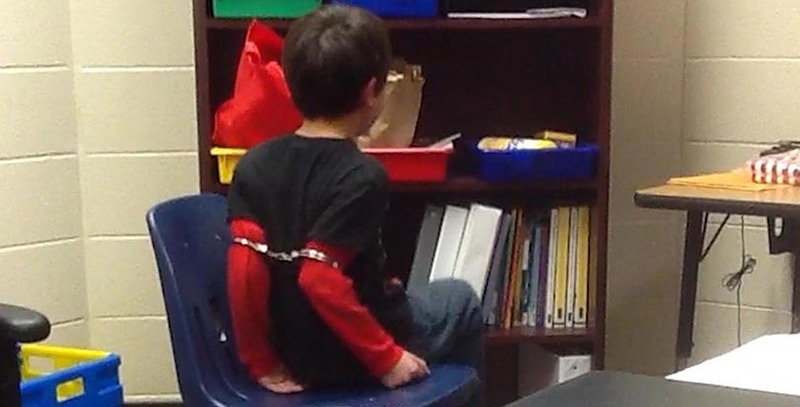 Restraint refers to the practice of restricting a student from moving parts of the body, such as with handcuffs. During the 2015-16 school year, students with disabilities represented about 12 percent of the total student population but accounted for 71 percent of children subjected to restraint and 66 percent of those who were secluded, according to the most recent federal data. That school year, nearly 86,000 children were restrained and more than 36,000 were secluded. Black students are disproportionately affected by the practices. Though black children account for 15 percent of America’s K-12 student population, they represented 23 percent of students secluded and 27 percent of those restrained during the 2015-16 school year. However, disability-rights advocates have long contended that schools chronically underreport seclusion and restraint incidents. The Kentucky lawsuit, which followed the release of a video of one incident that went viral online, is perhaps the highest-profile challenge to the use of restraint in schools in recent years. The American Civil Liberties Union filed the lawsuit on behalf of two disabled students — an 8-year-old boy and a 9-year-old girl — who were handcuffed around their biceps in 2014 by a sheriff’s deputy. In 2017, a federal district court ruled the punishment was an “unconstitutional seizure and excessive force.” In November, the sheriff’s office reached a $337,000 settlement with the plaintiffs. While Democratic lawmakers proposed federal legislation in November that aims to curtail the use of seclusion and restraint in schools, similar rules currently exist in about two-thirds of states. During the Obama administration, the Education Department released a guidance document that said districts should use seclusion and restraint only if children pose imminent danger to themselves or others. Denise Marshall, executive director of the Council of Parent Attorneys and Advocates, called the Education Department’s focus on the issue a “positive step forward” in protecting the rights of students with disabilities. “Restraint and seclusion are not education strategies; they are the failure of providing a meaningful education,” she said.